Today on my blog, I’m talking about all of my favorite fall home decor picks! If you’ve been following along on Instagram stories you’ve seen a little peak of my house right now and I’ve been loving how everything has come together! Above is a shot of our living room situation right now and I’ve been loving this color scheme. The light blue/green color mixed with oranges and grey looks so pretty together and almost still feels a bit neutral but fun too! My favorite picks are the blue pumpkin pillow case (Amazon) the mercury candle, and the buffalo check pillows! 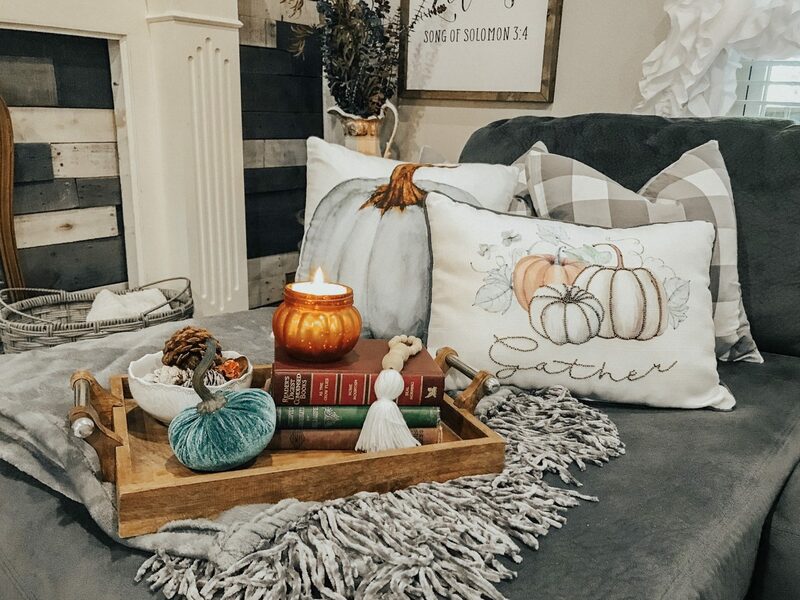 I just love it all and wish I could decorate for Fall all year round, haha. You can shop this picture below by simply hovering your mouse over the item you want to look at. Super easy! Happy shopping loves…and if you’re looking for even more of my picks you can click HERE to see some other favorites of mine. Previous Post It’s A BOY! !